1. Begin by first measuring the height of your wire mesh rebar. This may need to be cut according to the height of your ceiling. If so, you will need a hack saw or angle grinder to take off the proper amount. Mine happened to be the perfect height, so I left it as is. 2. Wipe your wire mesh with a clean, damp cloth to get rid of any dirt or grime. Spray paint your wire mesh with any color of your choosing. I went with this bright and vivid blue! Allow to dry completely and continue spray painting until you have full coverage. You can choose to put a top coat of clear acrylic to protect the paint. 3. Measure where you would like your wire mesh to be hung on the wall by using pencil markings to help guide where you will place your anchors. I decided to place four anchors in the wall to allow the weight to be distributed evenly, especially if you plan on hanging heavier items/plants. Before drilling a hole into your wall, be sure the bit is about the same width as your anchor. Drill a hole and then hammer your anchor carefully into the predrilled hole. Repeat as needed. 4. Simply twist your eye hooks into the anchors, then hang your wire on the hooks. 5. Now for the fun part! You get to play around with the arrangement of your pretty plants, but really, you can hang anything you desire! Use "s" hooks to hang pictures or other decor items! Then enjoy! Basements always seem so dark and dreary, but this project really helped the space feel bright, light and airy! It's definitely my favorite corner and I often gravitate to that side of the couch. 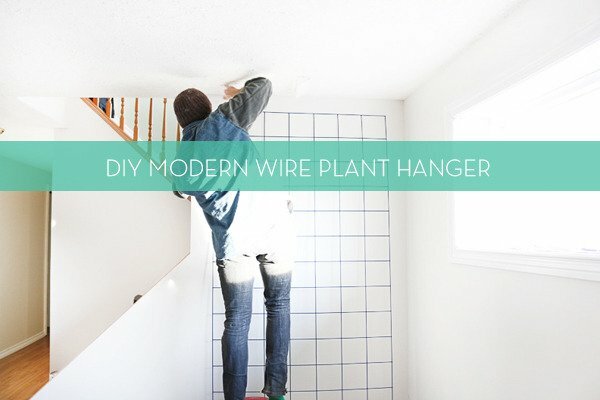 This modern wire plant hanger would look great in any room and I'm tempted to try it elsewhere. Like the kitchen, dining room, living room, bathroom or even a bedroom above the bed! I would love to wake up under plants everyday or am I starting to sound like a crazy plant lady? Hi where did you purchase the colorful hanging pots? @kate H That sounds like a wonderful plan! I got the grid rebar at Home Depot :) And yes, it was sold as shown in the pictures! This is so cool! I'm thinking of trying it in my bathroom with towel hooks and succulents! Can I ask where you find the wire grid rebar like that? Was it in a roll or sold in a sheet panel like you have there? @Kym Great question! All you need to do is make sure to install the plants on a wall where there is plenty of natural light streaming into the room (you can see we have a large window that gets plenty of light in the pictures above). I wouldn't recommend installing directly into a window, sometimes the light can burn or scorch the leaves, depending on the plant of course. You can look into purchasing low maintenance plants, such as a Pothos or Philodendron which do really well if there is no direct sunlight from a nearby window. If you don't have great lighting, then grow lights are definitely an option. Love this- where can I find these colorful hanging planters?!? That's very creative! Would also easily work in rental apts. and then you can hang photos, etc. without making a ton of holes in the wall. Great idea!